Today I thought I would share a card I made for a friend. These kind of cards are never easy to make and yet have an important place when sending a message to someone you care about. The stamp set I used, I am happy to say is carrying over from the Occasions catalog and will be included in the new annual catalog you are able to order from in June. So, that means, it is available for purchase now. In the Meadow is a versatile stamp set. At first glance, I thought it was a one trick pony, but I have made 2 cards with it, so far, and you can see they are very different. If you want to look at the other card, you can check that out here. 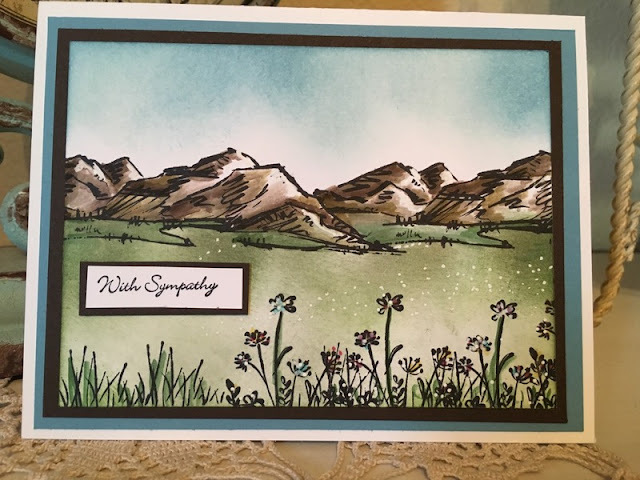 To make this card I stamped the mountains 2 times so that it appeared to be a continuation. I then stamped some flowers and grass in the foreground, to give the illusion of distance between the two. I went back and forth trying to decide if I should make the meadow in the middle, a meadow, or a lake. I really think I could have done it both ways. But, that's for another day. After the images were stamped, I decided to layer colors in the sky with a sponge to give the card a subtle and yet almost realistic depth. I think if I squint just right, I see some cloud formations and realism there. I used the same technique to add color to the meadow. I will add all the colors I used to the bottom of my post today. For the mountains, I used a blender pen to pick up color and then painted color on. I decided that my light source would be coming from the right, and that is also how the artist drew it, so I concentrated darker colors there and left the right side lighter. I then used the same method to add color to the grass and flowers in the foreground. Because the palette was mostly greens and browns, I wanted to add a little pop of color here and there, so using some of the Stampin' Right markers, I added little pops of colors. The last effect I added, which I believe finished off the card nicely, was I used a white gel pen and highlighted the flowers, the right side of the mountains and a smattering across the meadow. They have discontinued this pen from the new catalog, which I find unfortunate, so if you like that effect as much as I do, I would recommend purchasing one from your local craft store. I would be interested to know what you would like me to post in the future. Do you want video tutorials, photo tutorials, or any other ideas to share what I created? Let me know! And don't forget, any comment left here or on future posts up to May 25th, will enter you into a drawing for a brand new set of the new in-color Stampin' Write Markers. You can read about that, HERE. Beautiful card! Very serene looking scene! Love the trees and flowers in this set. Lots of possibilities! Wow, that coloring is impressive! 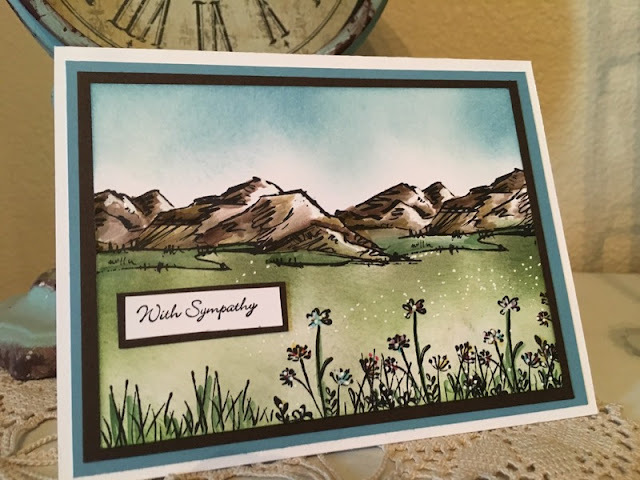 you did an amazing job with this Sympathy Card. you're right, never easy to make but you made it beautiful!